Today West Virginia tangler Beth Snoderly shares another tangle pattern with us and Nuwave has a very cool optical effect. Beth has shared several tangles and strings with the Zentangle® community and I always look forward to seeing what she comes up with as they’re usually a little “off the beaten path”. For tangles, simplicity rules! Nuwave is formed on a simple dot grid, but with a little practice you can create Nuwave without it and it’s a very easy and rhythmic tangle to draw. “This pattern came from from a vector graphic off the web. It is a simple but versatile pattern. You can shade in different patterns for a varied look.” Shading does add another level of depth to Nuwave, as I’ve used in my example. 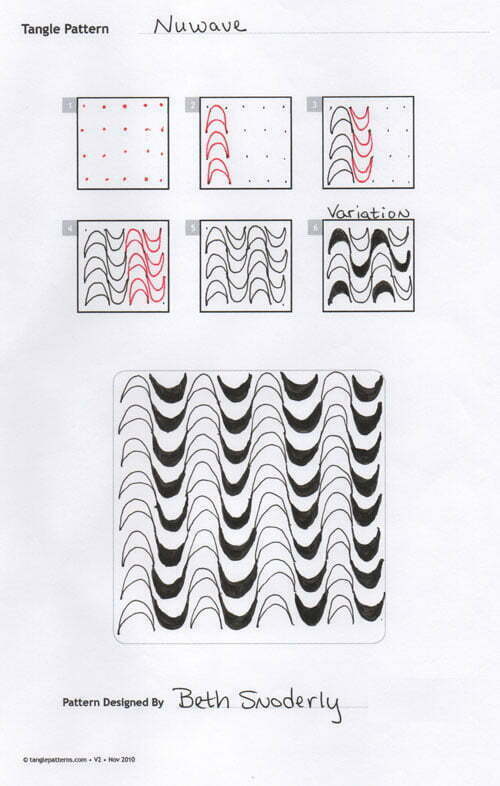 Beth illustrates the step-by-step instructions for drawing Nuwave below and features it in a simple monotangle. Very fun! Can’t wait to try it. Thanks Lara! I hope you like it! What a nice surprise and on a very special day! Today my Dad turned 85! One of my favorite things is to come up with new tangles and share them! Thanks Linda for all you do! This looks super fun-can’t wait to try! Thanks Daniel and Steve! Yeah, it really does look like the sand ripples that water makes on the beach! Lovely!!! So easy ….. Can’t wait to grab a sheet and a sharpie !! !